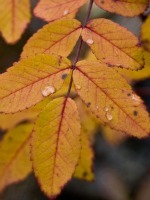 Clare V. Chamberlin of Kalamazoo, Michigan, passed away Sunday, August 28, 2011, in Kalamazoo. Mr. Chamberlin was born February 28, 1918 in Jackson, MI to Vernon and Clara (Waber) Chamberlin. 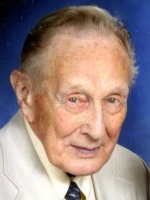 Clare was a 1936 graduate of Kalamazoo Central High School and began working in the paper industry during his high school years, for the Sutherland Paper Mill in Kalamazoo. He was later employed with North West Paper in Cloquet, MN and Manistique Paper in Manistique, MI before working at Georgia Pacific where he was the Associate Director of Field Service Printing Technology and retired in 1988. During WWII Clare served his country for four years in the U.S. Army 33rd Infantry Division in the Pacific Theater, earning a Bronze Star. He was a long time member of the Otsego United Methodist Church, a life member and 3rd Degree Master Mason of the Otsego Masonic Lodge, a member of American Legion Post 36 in Kalamazoo and the American Legion Post 36 Representative for Boys State. Clare served as a volunteer coordinator for Youth for Understanding and with his wife hosted 23 foreign exchange students. In his leisure time he was an avid fisherman and hunter, enjoyed golf, big band and jazz music and was an avid Detroit Tigers fan. When his sons were young he acted as a leader for the Indian Guides and coached softball. On February 19, 1949 in Kalamazoo he married Rosemary Vorce, who survives. Also surviving are three sons, Douglas (Gay Guard) Chamberlin of Chicago, Gregory (Tresca Allsman) Chamberlin of Hopkins, MN and Steven (Katherine Vasetsky) Chamberlin of Kalamazoo; one grandson, Dylan Chamberlin of Manchester, England; two sisters, Elaine Barrett of Kalamazoo and Norene Franz of Savannah, GA; many nieces and nephews. He was preceded in death by his parents; brothers, Louis and Alan; a sister, Patricia McGlinsey; and a special nephew, Richard Chamberlin. In keeping with his wishes, cremation has taken place. A Memorial Service will be held at 11:00 A.M. Thursday at the Winkel Funeral Home, Otsego, with Pastor Joe Shaler officiating and Pastor Jim Grant in attendance. Burial of ashes will be at Fort Custer National Cemetery. Contributions in memory of Clare may be made to Allegan County Soldiers and Sailors Committee. Gloria Dominguez Lemos of Santa Rosa, California passed away Wednesday, August 24, 2011, in Kalamazoo. Mrs. Lemos was born August 4, 1936 in Mexicali, Mexico to Paul Hernandez and Marie Dominguez. Gloria enjoyed going to the casino, reading and dancing. In 1956 she married Rosendo Lemos in San Fernando, CA, he preceded her in death in 2006. She is survived by her children, Irene (Jeffery) Midose of Otsego, Richard (Susan) Lemos, George Lemos, Rachael Lemos, Ruben Lemos, Marcos Lemos and Rosenda (Missy) Lemos Jr. all of California; 13 grandchildren; 11 great-grandchildren; and by her sister, Nolbertha Perez of Mexico. Cremation has taken place. A celebration of Gloria’s life will be held Monday, August 29, 2011 at 1 pm at Winkel Funeral Home, Otsego with Fr. Gordon Greene officiating. Contributions in memory of Gloria may be made to the American Cancer Society. 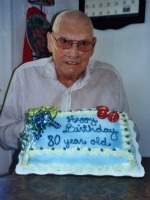 Arthur L. Roberts of Otsego, Michigan, passed away Monday, August 15, 2011 at his home. Art was born March 22, 1931 in Hooper, MI, the son of Anthony and Flora (Butler) Roberts. He served with the U. S. Army in Japan following the end of WW II. After 43 years, he retired from Rock Tenn Paper Company (formerly the MacSimBar). Surviving are his companion of 29 years, Doris Schuiteboer; 1 son, Art (Margo) Roberts of Plainwell; 3 daughters, Judy (Dave) Pearson of Plainwell, Kathy (Don) Walters of Allegan and Karen (Charles) Tripp of Allegan; 4 grandchildren; 2 great-grandchildren; many nieces and nephews. He was preceded in death by his wife, Ida, in 1982 and 12 brothers and sisters. In accordance with his wishes, his body has been donated to the U of M Medical School for research. A memorial gathering will be held Saturday August 20, 2011, from 3 to 5 P.M. at the American Legion Scout House, 410 E. Orleans St., Otsego, Michigan. Memorial contributions may be made to Wings of Hope Hospice. 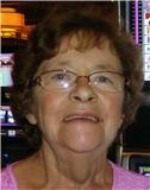 Donna L. Wolfe of Martin, Michigan, passed away Saturday, August 13, 2011 at her home. Mrs. Wolfe was born June 10, 1932 the daughter of Burnath and Margaret (Gardiner) Brabon. Donna had been employed at Kal-Equip, Parker Hannifin and Safari Technologies. In August 1973 she married Terry Wolfe who preceded her in death March 17, 2011. Also preceding her in death were her parents and brothers Ronald and Eugene. Surviving are her children, Kathleen (Darrell) Fraaza of Martin, Julia (Dan) Doran of Plainwell and Scott Matthews of Martin; 5 grandchildren, Kristin (Matt) Covault, David (Cammy) Fraaza, Kyle Fraaza, Nicole (Eric) Szczembara, Sarah (Josh) Gower; 4 great grandchildren, Elleghia, Halle, Kanley and Brinley; her siblings, Richard Brabon, Robert Brabon, Marian Phelps, Wendy Jarosiewicz, Deborah Doll and Gregory Brabon; many nieces and nephews. Friends may meet with her family from 6-8 P.M. Monday and 10-11 A.M. Tuesday at the Winkel Funeral Home, Otsego, where services will be held at 11:00 A.M., with Celebrant Bill Rose officiating. Cremation will follow the service. 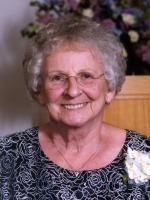 Marjorie A. Gilligan of Plainwell, Michigan, passed away Friday, August 12, 2011, in Kalamazoo. Mrs. Gilligan was born November 1, 1929 in Kalamazoo to Dewey and Helen (Thompson) Barber. Marge was a homemaker and was devoted to her grandchildren and great-grandchildren. She was a life member of the V.F.W. Ladies Auxiliary. On November 18, 1949 in Allegan she married Roger Gilligan, who survives. Also surviving are a son and a daughter, James (Carleen) Gilligan of Plainwell and Ann (Paul) Petersen of Otsego; three grandchildren, Sheila (Mike) Howard, Todd Petersen and Jaime (Aaron) Kortokrax; seven great-grandchildren; five sisters and a brother, Lucille Woodhams of Parchment, Mildred Walker Boss of Plainwell, Gerald (Lucille) Barber and Doris (Art Roberts) Schuiteboer, both of Otsego, Beatrice Gauthier of Plainwell and Beverly Gauthier of Otsego; many nieces and nephews. Cremation has taken place. A celebration of Marge’s life will be held on Sunday, September 4, 2011, from 1 to 4 P.M. at the Otsego V.F.W. Contributions in memory of Marge may be made to the V.F.W. Ladies Auxiliary, 124 N. Farmer St., Otsego, Michigan. Jean Parker Kneepkens of Kalamazoo, Michigan, died August 8, 2011 at Rose Arbor Hospice Residence. Jean was born March 20, 1935 in Neenah, WI the second of four daughters to Gordon and Fleurette Parker. She graduated from Neenah High School in 1953. Jean married the love of her life, Donald Kneepkens, Sr. from Kimberly, WI and they spent 56 years together. Jean is survived by her husband, Don; six children, Jon (Sandy), Kalamazoo, MI, Michael, Charlotte, NC, Susan (Ernie) Strom, Duluth, MN, James (Mindy), Corona, CA, Donald Jr. (Betsy), Duluth, MN, and Steven (Brenda), Phoenix, AZ. ; a sister, Judy (John) Helbach, Neenah, WI. ; 13 grandchildren; one great-granddaughter; many nieces and nephews and a dear friend, Candy. She was preceded in death by her parents, two sisters and a grandson. A memorial service will be held at a later date in Neenah, WI. The family suggests memorial contributions to Hospice Care of Southwest Michigan. Beatrice H. ‘Bea’ Cooper of Grand Rapids (formerly of Otsego) passed away Sunday, August 7, 2011, following a long battle with vascular dementia. Bea was born on April 27, 1932 in South Haven to Howard and Elda (Holmes) Englesby. Bea was a graduate of Paw Paw High School and attended Western Michigan University. She was a homemaker and for 28 years worked in the lingerie department at JC Penney in Kalamazoo. Bea loved numerous arts and crafts, gardening, family gatherings and especially spending time with her grandchildren and great-grandchildren. She was preceded in death by her parents; her former husband of 24 years, Al Cooper; and her brother, Howard Engelsby. Surviving are her daughters, Carol (Tom) Winkel of Grand Rapids and Karen (Rich) Harris of Plainwell; four grandchildren, Andy (Erin) Winkel and Stephanie (Scott) Ryan, all of Grand Rapids, Chelsea Harris of Kalamazoo and Cory Harris of Plainwell; five great-grandchildren, Brecken, Bennett and Brayden Winkel and Sydney and Tyler Ryan; her sister-in-law, Bonnie Englesby of Marion, NC; and a niece, Brenda (Burt) Gibbs of Marion, NC. In keeping with her wishes cremation has taken place. Friends may meet with her family at the Winkel Funeral Home, Otsego, from 6 to 8 P.M. Thursday, August 11, 2011 for a memorial gathering to celebrate Bea’s life. In lieu of flowers the family suggests donations be made to The Gilead Unit of Emerald Meadows Assisted Living, , 6117 Charlevoix Woods Ct., SE, Grand Rapids, MI 49546.